When most people think of medieval armor, they picture a knight on a horse clad head to toe in plate armor. The reality though is that what we think of as the classic “knight in shining armor” only came at the very end of the period, and only lasted for a short time. 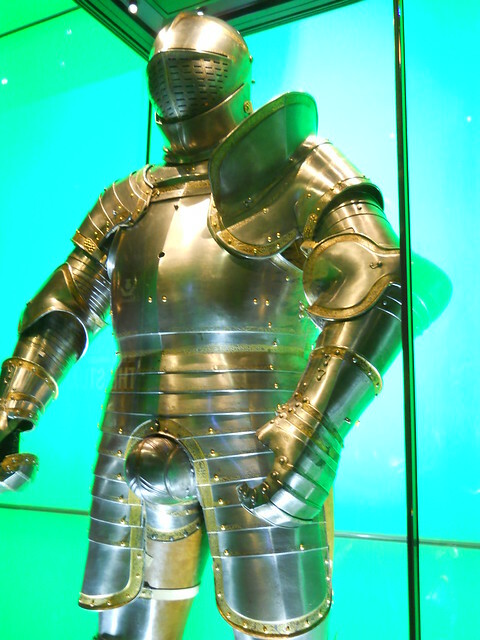 One of King Henry VIII’s jousting armors, on display at the Royal Armouries Museum. The exaggerated codpiece is completely deliberate and intentional. The earliest type of European armor that we know about was made from leather. Bronze Age spears and swords, the earliest metal military weapons, were soft and malleable, and rarely kept a sharp edge. A simple tunic made from leather, therefore, was pretty effective at stopping the weapon from penetrating. And leather was cheap to produce and easy to work with, making it procurable by most of the ordinary citizens who were recruited into the army as phalanx pikemen during a war. For the more wealthy men who served as officers and commanders, bronze made a more protective, but also more expensive, armor. The Greek “hoplite” style heavy shock troops would have worn helmets fashioned from sheets of bronze, with a molded bronze breastplate to cover the torso and bronze greaves on the lower legs. Additional protection came from a leather-covered wooden shield. When iron weapons began to appear (first used in large numbers by the ancient Hittites), leather was no longer capable of providing sufficient protection, and armor had to be improved. Probably the first modification was to harden the leather by boiling it in water and then carefully rubbing it with beeswax. This treatment stiffened and hardened the leather, making it more resistant to cuts and slashes. Cheap and easy to make, hardened leather armor persisted until well in the Middle Ages, when it was known as cuir bouilli. Another early type of armor, made by the “barbarian” tribes in what is now Germany and France, consisted of a leather tunic that was covered on the outside by a large number of rings made from thick iron wire, that were sewn on with leather lace. This gave good protection from sword slashes, but it was not very durable and had to be repaired often. It also did not defend well against heavy spear thrusts. So over time the “ring” armor was improved by adding more rings, smaller and packed more closely together for better coverage. Eventually, the leather lining was dropped, and the iron rings began to be woven together to form interlinked sheets of wire mesh. Today, we know this as “mail” (from the Old French word maille, or “chain”–the common modern reference to “chainmail” is inaccurate). The Roman Republic, after encountering mail armor in its opponents, knew a good thing when they saw it, and adopted it for themselves. In most of the city-states or barbarian tribes of the Roman times, “armies” consisted of ordinary citizens who were, in time of war, called together to form a sort of militia. Because each individual would provide his own armor and weapons, there was no uniformity, and there would be a wide range of protection, from the wealthy elite in mail shirt and iron helmet armed with a sword, to a poor servant with a simple spear and wooden shield, perhaps with a leather helmet or tunic. The Roman Republic, on the other hand, formed one of the first professional armies made up of fulltime soldiers whose equipment was standardized and was provided to them at state expense. Unlike their “barbarian” opponents, who fought simply as a loose mass of individuals, the Roman Legion was a tightly disciplined group that fought together as a single unit under the direct control of their officers, allowing them to take on and defeat much larger forces than themselves. The primary weapon of the Roman Legionary was the short gladius sword. The primary defense was the large square scutum shield, made from wood rimmed with metal. The lower half of the Roman soldier’s body was essentially unarmored, and was protected by the shield. To defend against missile weapons such as slings and arrows, and also against downward slashes from barbarian long swords, the Romans developed iron helmets with a series of protective ridges and a flange at the back to protect the neck. While the mounted troops and auxiliary forces still wore mail, the frontline Legionaries adopted a new type of armor made by stringing together a series of iron strips with rivets, straps and buckles. One series of strips ran around the body, and another series crossed over the shoulders. It was lighter than mail, but was still flexible and, combined with the shield, provided good protection. While this type of armor became the standard for the Roman Republic/Empire for the next 500 years, we do not know what the Romans actually called it, and it is known today simply as lorica segmentata(“segmented armor”). After the collapse of the Roman Empire in the 5th century, Europe fell into the Dark Ages, in which numerous tribes and petty kingdoms warred constantly on their neighbors. The “professional army” of the Romans disappeared, not to be resurrected again until Oliver Cromwell’s “New Model Army” a thousand years later. Once again, “armies” were temporary gatherings of the local populace, equipped with a mishmash of whatever cheap weapons and armor they could procure, commanded by a small coterie of professional men-at-arms with the best weaponry and armored protection. Known at first as huscarls (“house guards”), they later evolved into “knights”. During this time, mail armor ruled supreme. A typical huscarl would be armed with an axe or sword. On his head would be a spangenhelm, a conical iron helmet with a straight iron tongue over the nose to protect the face. His body would be protected by a shirt of mail, known as a hauberk. Since most warriors in this period fought on foot, the hauberk would usually reach down to the knees. Painstakingly made by riveting together each link, a single hauberk weighed as much as 40 pounds and contained some 40,000 rings. Only the nobility and their retainers could afford them. The commoners who made up the bulk of the army, by contrast, had only a spear and a wooden shield; if he were lucky he might have a leather tunic or maybe even a helmet. For the next few centuries, armor hardly changed at all. A typical knight of the 12th Century Crusades would have been readily recognizable to any 6th century huscarl. The Crusader would have worn a mail hauberk that stretched to the knees, split in front and back to allow him to mount a horse. Underneath would be a padded quilted garment known as a gambeson, which would absorb the impact of any blows (mail is good at stopping cutting weapons, but it transfers all of the shock from a blunt weapon, like a mace or a war hammer, straight into the wearer’s body). Sometimes he would be wearing a set of tubular mail leggings called chausses, which tied to his belt, to protect his legs. Although a knight would have had several horses, they were used only for transport: in actual battle he would have dismounted and fought on foot, usually with a sword. On his head would be a coif (a hood made of mail), and over that would be a Great Helm, a flat-topped cylindrical helmet with a narrow eyeslit. By the 14th century, two innovations in weaponry forced a new change in the knight’s armor. The first of these was the appearance of large numbers of crossbows and English longbows. Both of these shot a projectile which, when tipped with a tapered bodkin point, could pierce mail. The other was the appearance of the couched lance, which, with the full power of a galloping war horse behind it, allowed a mounted knight to pierce the mail armor of his opponent. In response, armorers began reinforcing their mail hauberks with solid metal plates. Since the technology of the time did not allow them to make large pieces of sheet steel, they made do with smaller plates. Knights began wearing cloth surcoats over their mail hauberks, inside of which a number of overlapping steel plates had been sewn. It was known as a “coat of plates”. Another version of this used rivets to attach square steel plates to the inside of a tunic or jerkin. Because this did not look at first glance like armor, it was favored by robbers, brigands and outlaws, and became known as “brigandine”. As metal-working technology improved over the years, it became possible to make large steel sheets of uniform thickness, and then shape them into molded forms. Helmets began to appear that were forged from a single piece of steel and fitted with hinged visors that could be raised or lowered. The coat of plates was replaced with a single-piece steel breastplate that fit over the mail armor to give added protection, and the wooden shield, used since the days of the barbarians, disappeared. After a time, the mail itself began to disappear, and armor plates began to cover the entire body, held together with rivets and leather straps. By the 15th century, plate armor began to encase the knight in a full steel exoskeleton, protecting every square inch of his body from head to toe. Although a suit of plate armor looks heavy and cumbersome, it is not. Each piece is carefully designed to give maximum protection while still allowing the knight the full mobility and dexterity that he needs in combat. All of the joints, right down to the fingers, are made from articulated pieces that allow a complete range of motion. The wealthy noblemen would have their armor individually fitted, with each piece carefully measured. Contrary to popular myth, medieval knight’s armor was not so heavy that he needed a crane to be lifted onto his horse, or couldn’t get up again if he fell to the ground. A typical set of plate armor weighed about 45 pounds–not much more than a mail hauberk, and indeed not much more than the typical load of body armor and ammo that a modern soldier carries into combat today. The medieval armor was designed so that most of the weight fell on the hips and not the shoulders, which made it much easier and nimbler to wear than a typical hiker’s backpack of today. A noble knight of the late 15th century would have had at least three full suits of plate armor, each specialized for a different purpose. One set would be for battle: this would have been extra-thick for protection, and would be plain and unadorned, it’s only purpose being utilitarian. Another set would be ceremonial, to be worn on occasions where showing off was the aim. Not being intended for actual use, it would be thinner and lighter than battle armor, but would be highly ornate, decorated with ridges and scrollwork and perhaps gilded with gold patterns. Its purpose was to demonstrate the nobleman’s wealth and social status. The final set of armor would be for jousting, the popular full-contact sport of the medieval nobility. Jousting combined both battle and ceremony, and jousting armor was highly specialized. It would be made to be as dazzling as possible, with fluted pieces and showy personal crests. But it would also be functional, with particular pieces made extra-heavy to absorb a lance blow, and with custom pieces for the joust, such as shoulder-shields and lance-arrests. Today, nearly all of the armor suits in museums are ceremonial or jousting sets, preserved for their flashy and ornate appearance. They are a far cry from the plain unadorned armor that was actually worn in battle. When the firearm, in the form of the matchlock musket, began appearing on the battlefield, armorers tried to adjust to keep up. Breastplates were made especially thick and heavy to protect the wearer against lead musket balls. Completed breastplates would be actually shot with a musket to test them, and the round dent left in the armor, visible evidence that the plate was really bulletproof, became known as the “proofmark”. But the advent of the firearm spelled the death-knell for the knight in plate armor. By the 17th century, the mounted armored lancer of chivalrous lore had disappeared from the battlefield. Today, one of the most extensive exhibits of ceremonial and jousting plate armor is the Royal Armouries National Museum of Arms and Armor, on display at the Tower of London. Most non-European armor, such as Japanese samurai armor, or Chinese or Indian armor, was completely different. They used mostly “lamellar” armor, in which small plates of leather, often stiffened with layers of lacquer, were woven together with silk cord to form a light but flexible armor. And here in Africa, the warriors did not use much in the way of body armor, but used shields made of cattle skins. As far as I know, these were not specially hardened; the fresh skin would just be dried so that it became fairly stiff and inflexible. It was enough to ward off both spears and blunt weapons. When King Shaka devised his new military tactics, his main point was getting past the opponent’s shield rather than attempting to go through it. Raw hide shields yes. Tough as hell but not so good in wet weather. Raw hide also makes a great addition to a wooden shield if placed along the edges and allowed to dry.. Modern re-enactors use those raw hide dog bones that most pet shops sell. Native American tribes had the same problem with their sinew bowstrings–they didn’t work if they got wet.